REL Midwest conducts research studies and offers training, coaching, and technical support to address our partners' research questions, provide policymakers and practitioners with information they need to make decisions, and build individual and organizational capacity to understand and use research in education policy and practice. These efforts have resulted in the following published reports and tools for practitioners, policymakers, researchers, and other interested stakeholders. 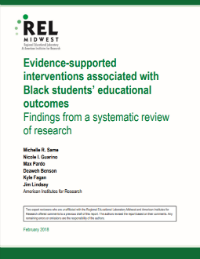 REL Midwest conducted a systematic review of research on interventions that may improve academic outcomes for Black students. A related infographic [347 KB ] highlights the study’s key findings. 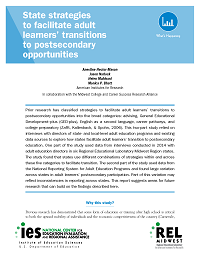 The purpose of this study was to catalog the array of strategies Midwest states use to support adult learners' transitions to postsecondary opportunities. 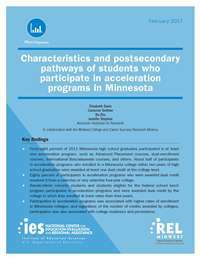 This study examined participation in the various acceleration programs available to Minnesota high school students, including Advanced Placement and International Baccalaureate coursework, postsecondary enrollment options, concurrent enrollment, and other/unknown programs. Working closely with the former Early Childhood Education Research Alliance and Iowa's Quality Rating System Oversight Committee, REL Midwest developed a new tool to help states collect data on the improvement activities and strategies used by early childhood education providers participating in a Quality Rating and Improvement System. 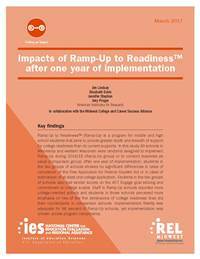 This study examined whether the Ramp-Up to Readiness program (Ramp-Up) produced impacts on high school students' college enrollment actions and personal college readiness following one year of program implementation. 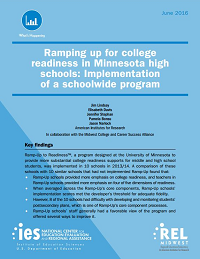 The study also looked at Ramp-Up's impact on more immediate outcomes, such as the emphasis placed on college readiness and the amount of college-related teacher-student interactions taking place in high schools. 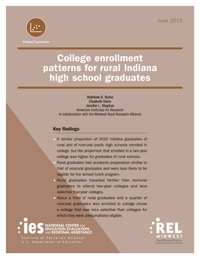 This study examined rural-nonrural differences in postsecondary educational expectations and the attainment of expectations for grade 10 students attending rural and nonrural high schools in the REL Midwest region and how these differences compare with rural-nonrural differences in the rest of the nation. 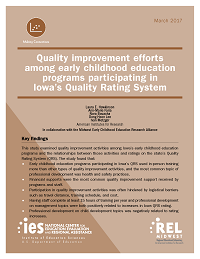 This study examined the use and outcomes of quality improvement activities among early childhood education programs participating in the Iowa Quality Rating System. 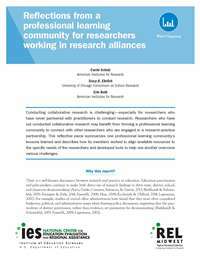 This publication shares lessons learned about the challenges that REL Midwest researchers brought to a professional learning community and the strategies and tools that they used to overcome them. This report shares lessons learned by REL Midwest researchers as they worked with educators in Michigan and Minnesota to establish and sustain two networked improvement communities. This training resource can be used to help staff in schools, districts, and state agencies more effectively design and conduct surveys on education topics. 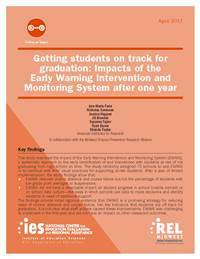 This study examines the impacts of the Early Warning Intervention and Monitoring System (EWIMS), a systematic approach to early identification and intervention with students at risk of not graduating on time. The Minnesota Department of Education partnered with REL Midwest to redesign the state's teacher supply and demand study in order to increase its utility for stakeholders. This report summarizes the four-step process that was followed in redesigning the study. 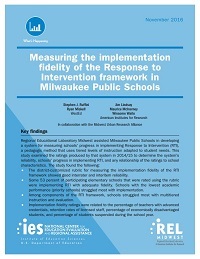 The purpose of this study was to determine the reliability of a newly-developed hybrid system to measure the implementation of Response to Intervention (RTI), to determine schools’ progress toward implementing RTI; and to determine whether implementation ratings were related to contextual factors. REL Midwest, in partnership with its Educator Effectiveness Research Alliance, conducted a study on the mobility of teachers and administrators in public schools within and between Iowa, Minnesota, and Wisconsin. This study was the first to examine educator mobility within and among these three states using the same methodology across the states. 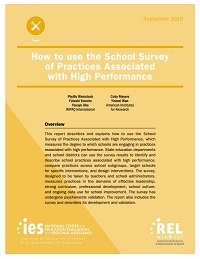 REL Midwest, in partnership with its School Turnaround Research Alliance, developed a survey that state education departments and school districts can use to measure the degree to which schools are engaging in practices associated with high performance. 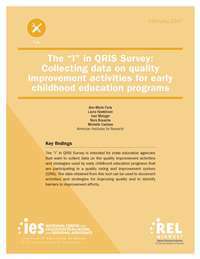 This guide includes information regarding ways that principals and educators can use the survey, as well as the development of the survey and its psychometric validation. 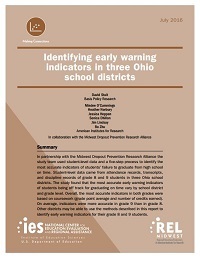 This study sought to identify a set of data elements for students in grades 8 and 9 in three Ohio school districts that could serve as accurate early warning indicators of their failure to graduate high school on time and to comparatively examine the accuracy of those indicators. 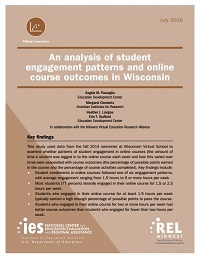 This study sought to identify distinct patterns—or trajectories—of students' engagement within their online courses over time and examine whether these patterns were associated with their academic outcomes in the online course. The study used data collected by Wisconsin Virtual School's learning management system and student information system. This study examined whether the Ramp-Up to Readiness program differs from college readiness supports that are typically offered by high schools, whether high schools were able to implement Ramp-Up to Readiness to the developer's satisfaction, and how staff in schools implementing Ramp-Up to Readiness perceive the program. This study examined quality rating and improvement systems (QRISs) in use across the Midwest Region to describe approaches that states use in developing and implementing a QRIS. The purpose was to create a resource for QRIS administrators to use as they refine their systems over time. This study analyzed the results of a survey administered to Wisconsin Virtual School teachers about the training in which they participated related to online instruction, the challenges they encounter while teaching online, and the type of training they thought would help them address those challenges. 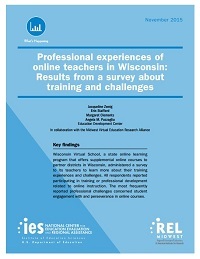 The report includes a copy of the survey that states, districts, or other online learning programs can use to collect data about the professional experiences of their online teachers. This study examined 1) average distances traveled to attend college, (2) presumptive college eligibility, (3) differences between two-year and four-year college enrollment, (4) differences in enrollment related to differences in colleges’ selectivity, and (5) degree of “undermatching” (i.e., enrolling in a college less selective than one’s presumptive eligibility suggested) for rural and nonrural graduates among Indiana’s 2010 high school graduates. 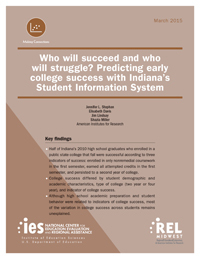 This study examined whether data on Indiana high school students, their high schools, and the Indiana public colleges and universities in which they enroll predict the students' academic success during their first two years in college. 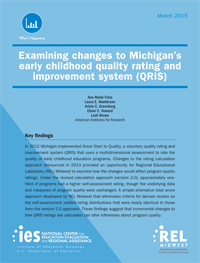 This study described how early childhood programs were rated in Michigan's Quality Rating and Improvement System (QRIS) and examined how alternative approaches to calculating ratings affected the number of programs rated at each quality level. 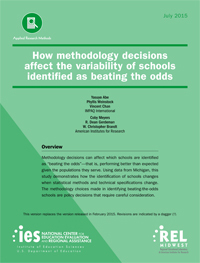 This study examined how a list of beating the odds (BTO) schools might change depending on the methodological choices and selection of indicators used in the BTO identification process. 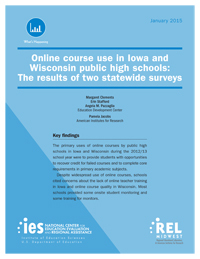 This study involved the development and administration of a survey to describe online course use in Iowa and Wisconsin brick-and-mortar public high schools during the 2012–13 school year. 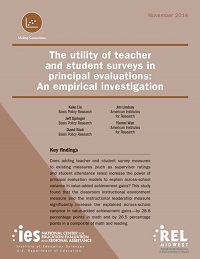 This study examined whether adding student and teacher survey measures to existing principal evaluation measures increases the overall power of the principal evaluation model to explain variation in student achievement across schools. 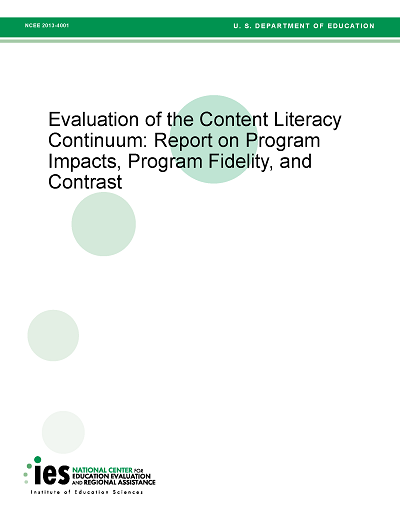 This study examines impacts of the Content Literacy Continuum (CLC) on high school students’ reading comprehension and accumulation of credits in core subject areas. CLC combines whole-school and targeted approaches to supporting student literacy and content learning using instructional routines and learning strategies developed by the University of Kansas Center for Research on Learning. This study examined the impact of the Measures of Academic Progress (MAP) program on student reading achievement and teachers’ use of differentiated instructional practices. The MAP program is one of the most widely used commercially available systems incorporating benchmark assessment and training in differentiated instruction. 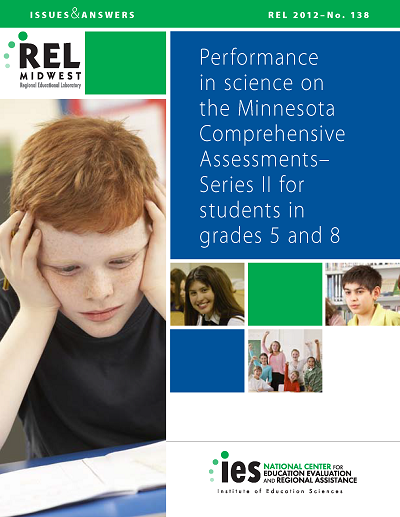 This report examines how grade 5 and grade 8 student achievement on the 2009/10 MCA–II science assessment differed by student and school characteristics. The study found that most of the variation in scores was associated with demographic differences among students rather than with differences between schools. 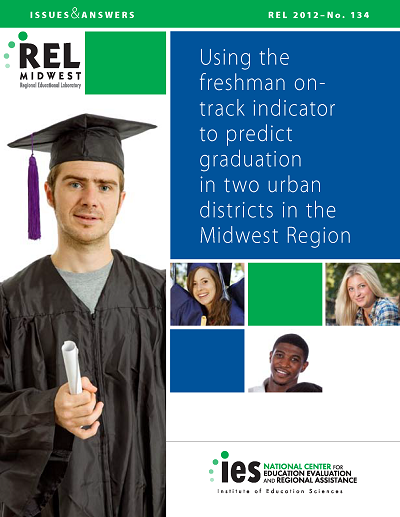 This report examines how well the freshman on-track indicator developed by the Consortium on Chicago School Research predicts on-time graduation in two urban districts in the Midwest Region. This indicator classifies students at the end of the first year of high school as on-track or off-track to graduate based on grade 9 course credits earned and failures. 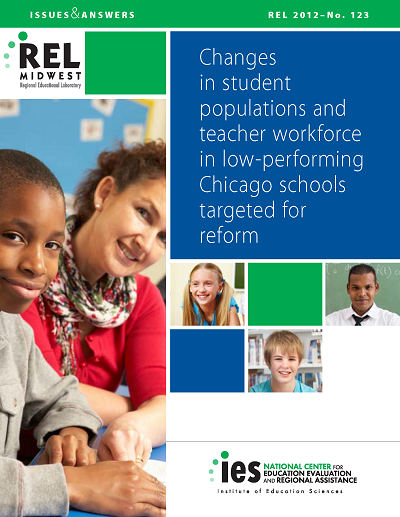 This REL Midwest report examines changes in student populations and teacher workforce in 31 chronically low-performing Chicago public schools. These schools were selected for district-led reform interventions following five distinct types of reform models. National and state policymakers are concerned that the principal workforce is aging, that fewer new principals are joining the workforce, and that fewer female and racial/ethnic minority educators are entering and remaining in the principal workforce. 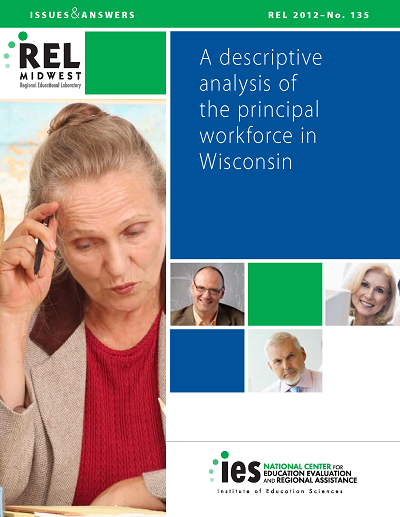 This study describes trends in demographic characteristics and retention rates in the Wisconsin principal workforce between 1999 and 2009. Like other states across the country, the seven REL Midwest Region states have been striving to meet the performance targets established under the No Child Left Behind Act of 2001. 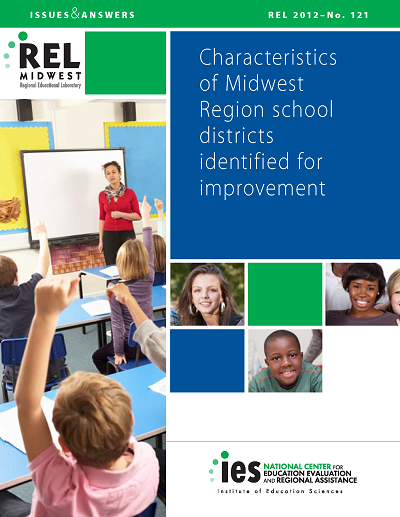 This report presents statistical profiles of school districts designated as “in improvement” in the Midwest Region states as of 2009/10. It compares the prevalence and characteristics of these districts and those of districts not in improvement. 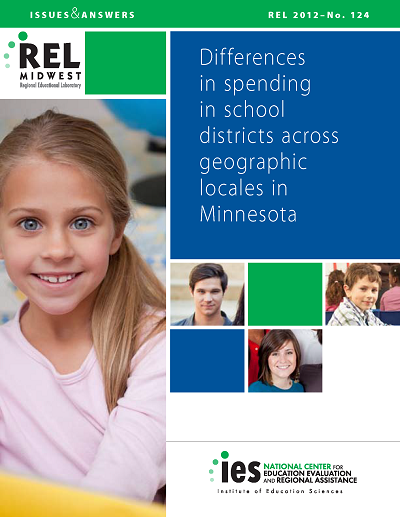 This REL Midwest study uses comparative descriptive analysis to examine five types of district spending per student for prekindergarten–grade 12 in seven locale types. 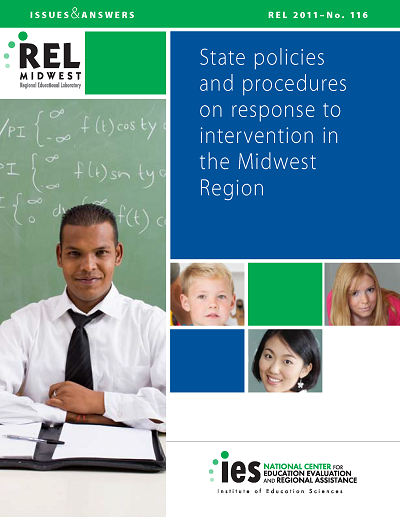 Based on a review of state documents and interviews with state and local officials in six Midwest Region states, this qualitative study describes state education agency policy development and planning for response to intervention approaches to instruction. It also looks at the support provided to districts and schools implementing response to intervention. 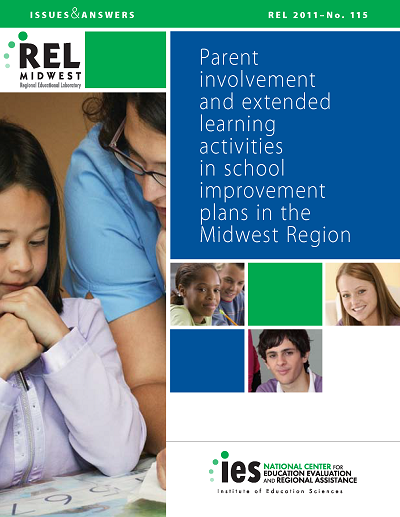 Analysis of school improvement plans in five Midwest Region states reveals that more than 90 percent of plans included at least one “potentially effective” parent involvement activity and 70 percent included at least one extended learning activity (a before-school, afterschool, or summer program). Few extended learning programs were described as providing academic support. 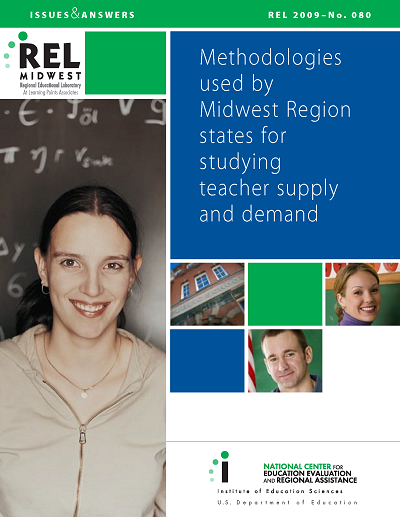 This report describes how state education agencies in the Midwest Region monitor teacher supply, demand, and shortage; details why they monitor these data; and offers estimates of the monetary costs incurred in performing such studies. 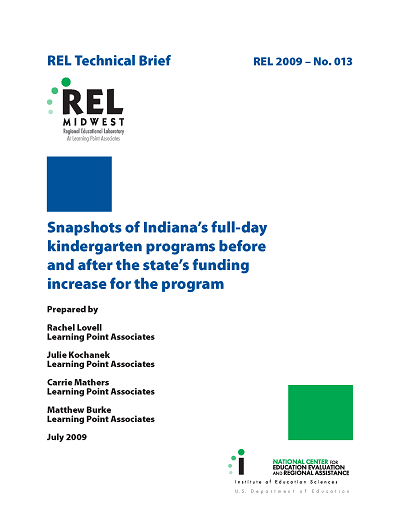 Following an increase in full-day kindergarten funding, the Indiana Department of Education and the Indiana State Board of Education requested assistance from REL Midwest to analyze Indiana administrative data so that the agencies could report to the legislature. This technical brief describes Indiana’s full-day kindergarten enrollment patterns before and after the legislation (in 2006/07 and 2007/08) both in the state at large and in individual school corporations (equivalent to school districts). 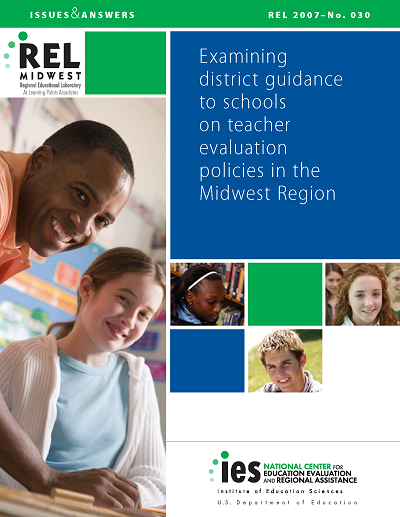 This technical brief describes state-level policies and procedural requirements for guiding teacher evaluation practices at the district level in the seven states served by REL Midwest. Building on the report Examining district guidance to schools on teacher evaluation policies in the Midwest Region (Brandt et al. 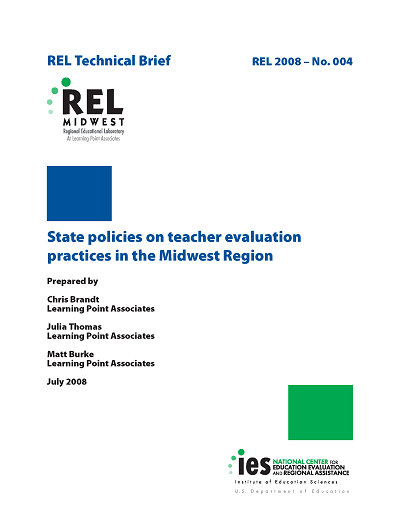 2007), this brief reveals how teacher evaluation practices are addressed by state policies and other state-level initiatives that include teacher evaluation features. Representatives from the Michigan Department of Education and the Center for Educational Performance and Information requested assistance in estimating Michigan’s capacity to adequately staff its high schools to meet the course requirements of the new Michigan Merit Curriculum. The study team devised a formula to estimate the number of additional full-time equivalent teachers needed for each subject at each Michigan high school. Schools can adjust the variables in the formula to fit their own needs. This descriptive study provides a snapshot of teacher evaluation policies across a demographically diverse sample of districts in the Midwest Region. It aims to lay the groundwork for further research and inform conversations about current policies at the local, district, and state levels. Research can improve understanding of two-year colleges, but new detailed indicators are needed to capture the complexities of this changing sector. 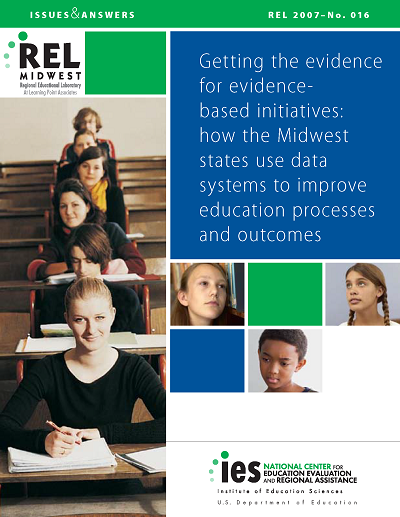 States in the Midwest Region are developing innovative approaches to collecting and providing access to high-quality data in order to improve educational decision making. Additional capacity-building and increased technical assistance at the state and local levels would enhance this work.